1972 GT380J in Roman Red and Egret White. Note drum style front brake used on this MY only. 1976 GT550A in Forest Green Metallic with optional factory parcel rack. Note Ram Air cooling shroud on top of the cylinder head. 1973 GT750K in Pearl Red and Tan. Note double disk front brake. 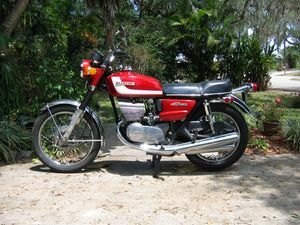 The Suzuki GT series of motorcycles was introduced to the world in the fall of 1971 as 1972 model year (MY) motorcycles. The final MY of production was 1977 although some markets continued to receive the GT380 to the end of the 1980 MY. In the interests of brevity the single cylinder models designated as GT have been omitted from this article because they were produced much later and were not true grand tourer (GT) models in the strictest sense. All engines were piston ported two-stroke types equipped with Suzuki's proven Crankcase Cylinder Injection (CCI) multipoint oil injection system (previously known as PosiForce), conventional battery/points ignition system and chain-type final drive. The engines were designed following Suzuki's typical conservative design philosophy and featured classic Schnuerle porting. In a major departure for Suzuki, the alternator fitted was a three-phase excited field type using brushes and slip rings with a wound rotor. A solid state rectifier and a mechanical three-step regulator completed the system. Up to this point, Suzuki had typically used a permanent magnet single phase alternator setup on its bikes so the new equipment was quite a step up for the GT series. The 380 and 550 engines were air cooled with a system that Suzuki christened "Ram Air". This system consisted of a cast aluminum shroud covering a modified cylinder head to direct the cooling air. The GT750, however, was liquid cooled. Suzuki thus lead the motorcycle world by being the first company to mass produce a liquid cooled motorcycle - a big bore two-stroke The GT750 was quickly nicknamed the "Water Buffalo" in North America, the "Wasserbuffel" in Germany, the "Kettle" in the UK and the "Water Bottle" in Australia as signs of the affection felt by owners for this high torque two-stroke roadburner. This affection continues well into the new millennium with the GT750 having a large and loyal following worldwide dedicated to the reclamation and restoration of this unique machine. As well, all models were equipped with drum brakes front and rear. This arrangement only lasted for the 1972 MY. All of the 1973 MY three cylinder machines were equipped with hydraulically operated single disk brakes on the front while retaining their drum brakes on the rear. The GT750, however, had dual disks up front to cater for the braking requirements of this heavier and more powerful machine. This dual disk brake setup was another big "first" for Suzuki since all the competitors were using single front disks only at this time. All models were equipped with five-speed transmissions with the exception of the GT380 which had a six-speed. The GT550 and GT750 also sported electric starting which is not truly necessary on a two-stroke engine, even ones as large as these. Apparently the sales department felt that the "electric leg" was a must-have item to keep up with the competitors. All other models, with the exception of the GT185, were kick start only. All three GT models followed Suzuki's usual conservative design principles. The frames were all-welded mild steel tubing with long wheelbases to give stability at high speed. 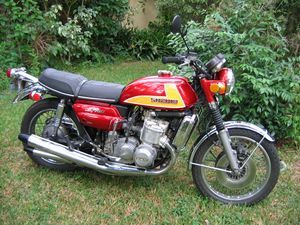 Each of these models was available in two different color schemes with the GT750 being available in three colors in most markets for the initial MY only. It reverted to two color schemes for succeeding MYs. The engines were mildly tuned to produce more torque than the competition who were producing highly stressed machines with outright power for straight line performance. Suzuki was more concerned with durability and ease of use for its customers. The GT series of machines were large and substantial motorcycles designed for high speed highway riding following the tradition of European touring cars. Another feature differentiating the three cylinder GT models from their competitors was the bifurcation of the center cylinder exhaust header. This allowed Suzuki to use four mufflers rather than the "unbalanced 2 and 1" arrangement used by the Japanese competition.....or the "three into two" exhaust arrangement favored by the British manufacturers of three cylinder machines. For the 1973 MY, the venerable T250 twin was updated with new bodywork, gained Ram Air cooling, a single disk brake in front and was now designated GT250. This model thus filled the important 250cc displacement slot in Suzuki's GT lineup. The GT250 retained its original engine and six speed transmission, both remaining basically unchanged from the T20 X6 Hustler of 1966 through the T250 model to the 1972 MY. The marketing name of "Hustler" was retained for the North American market. The GT250 continued on with minor changes until the 1976 MY when the engine was changed substantially, both internally and externally. Porting changes now saw the cylinders with four larger transfer ports instead of the previous two smallish ones as well as changes to the CCI system in the crankshaft main bearing area. The carburetors became 28mm in size instead of 26mm, the mufflers were modified to cater for the increased airflow through the engine and the transmission ratios were revised to more evenly match the new powerband. The Ram Air cover for the head was deleted and the stock finning on the heads was increased in height to gain the same effect as the Ram Air used to give. Also for the 1973 MY, Suzuki introduced the GT185 twin cylinder model which was equipped with Ram Air cooling and drum brakes front and rear. It was marketed in North America as the "Adventurer". It also had a unique combination electric starter/generator setup. For the 1974 MY, the GT185 gained a single disk front brake to rationalize it with the other GT models. It then remained basically unchanged, except for color and trim items, through to the end of production with the 1978 MY. An important change for the 1974 MY was the "unitizing" of the carburetors on all of the three cylinder machines. For MYs 1972 and 1973 the carburetors had been three separate items with the complex cabling that such an arrangement entails. The unitized carburetors were mounted to a single bracket with a much less complex single push-pull cable arrangement. This arrangement allowed easier and more durable synchronization of the carburetors. This practice was continued through to the end of production of the three cylinder models. At this point the GT750 received the new Mikuni BS40 type diaphragm style carburetors. These proved to be somewhat troublesome but were eventually sorted out with some remedial jetting work in the field. All the smaller models stayed with the tried and true Mikuni VM type round slide carbs. The 1974 MY also saw Suzuki introduce the GT125 to the motorcycling world. This model was similar in layout to the GT185 but with a shorter wheelbase and smaller engine displacement so shared only a few common parts. The rest of this model's equipment followed that of the GT185. The electric starter was deleted, probably in the interests of economy, which allowed a more attractive selling price in the very competitive "beginner" market that this model competed in. This model continued basically unchanged, excepting colours and trim items, until the end of production with the 1977 MY. Some markets may have received 1978 MY versions of this model but there is currently no evidence supporting this assertion. This model was never marketed in North America so was not assigned a marketing name like its larger siblings. Another marketing anomaly concerned the GT380. The actual engine displacement as introduced in the 1972 MY was 371cc and the 380 stayed this way until the end of production for most market areas. However, for the Italian market only, the GT380 received a displacement increase to 384cc starting with the 1975 MY. This engine size was continued through to the end of production for Italy alone. This was a counter to an Italian government import ban on bikes less than 380cc and less than 170 kg. Suzuki simply increased the bore of the GT380 to 55mm thus making the engine capacity now 384cc. Suzuki also made sure that the data plate riveted to the frame showed a weight of 171 kg. An additional anomaly concerned the GT550. Like all engines of this period, the 550 started life with chrome-plated piston rings running in cast iron cylinder bores. However, for the 1976 MY, the 550 received a very forward thinking design change that featured cast iron rings running in chrome-plated cylinder bores. This change MAY have had something to do with Suzuki's recent venture into the snow machine market in North America starting in the 1973 MY. For whatever reason, the only market to receive this innovation was continental Europe i.e. France, Germany, Italy. The rest of the world continued on with the original 550 design. The Japanese home market MAY have received this same modification but this is unclear. Production and sales went along quite successfully from the initial 1972 introduction, no doubt helped by periodic updates and the introduction of the smaller capacity models for beginners. For the 1976 MY, the ageing T500 Titan was given a new front end with a single disk brake as well as freshened up bodywork. It was henceforth known as the GT500. The GT500 was discontinued at the end of the 1977 MY so had a very short production life. The GT500 was not graced with Ram Air cooling, probably because Suzuki already knew that their large capacity two stroke road bikes were reaching the end of their production lives. It was probably a way to get a few more sales dollars from what had now become a very dated design reaching back to the 1968 MY. With the 1977 MY Suzuki, bowing to the inevitable, had introduced its line of four stroke GS machines starting with the 750cc and 550cc four cylinder and the 400cc twin cylinder. The two strokes and four strokes were sold side by side for one MY. The glory days of smooth and sophisticated two-stroke road machines came to an end with the 1977 MY. The Suzuki factory went racing at various levels with both the GT750 and the T500. The models were the TR750 and TR500 respectively. ↑ Landon Hall (March/April 2007). 1973-1977 Suzuki GT380. Motorcycle Classics. Retrieved on 2009-08-12. Pages in category "Suzuki GT series"
This page was last edited on 23 November 2010, at 22:52.